Definition at line 39 of file llmediamoviebase.h. Definition at line 38 of file llmediamoviebase.cpp. Definition at line 45 of file llmediamoviebase.h. Definition at line 230 of file llmediamoviebase.cpp. Definition at line 220 of file llmediamoviebase.cpp. Definition at line 130 of file llmediamoviebase.cpp. Definition at line 148 of file llmediamoviebase.cpp. Definition at line 157 of file llmediamoviebase.cpp. Definition at line 139 of file llmediamoviebase.cpp. Definition at line 166 of file llmediamoviebase.cpp. Definition at line 202 of file llmediamoviebase.cpp. Definition at line 184 of file llmediamoviebase.cpp. Definition at line 193 of file llmediamoviebase.cpp. Definition at line 175 of file llmediamoviebase.cpp. Definition at line 106 of file llmediamoviebase.cpp. Definition at line 45 of file llmediamoviebase.cpp. Definition at line 82 of file llmediamoviebase.cpp. References LLMediaBase::mMediaEventEmitter, LLMediaObserver::onPause(), TRUE, and LLMediaEmitter< T >::update(). Definition at line 69 of file llmediamoviebase.cpp. References LLMediaBase::mMediaEventEmitter, LLMediaObserver::onPlay(), TRUE, and LLMediaEmitter< T >::update(). Definition at line 211 of file llmediamoviebase.cpp. Definition at line 113 of file llmediamoviebase.cpp. Definition at line 121 of file llmediamoviebase.cpp. Definition at line 94 of file llmediamoviebase.cpp. 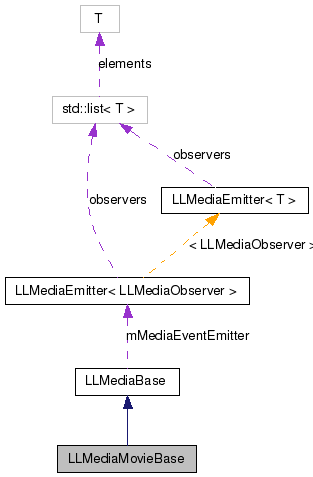 References LLMediaBase::mMediaEventEmitter, LLMediaObserver::onStop(), TRUE, and LLMediaEmitter< T >::update().